If you haven't seen on the gram, I'm part of an on-going partnership with Conair Man, charged with the mission to discuss all things related to grooming! From beards, to body hair, I'm leaving no stone unturned! For today's post, we're moving beyond basic daily maintenance, and focusing on grooming for the holidays (with a few great gift ideas thrown in)! Shave your neck!! This is my first and biggest grooming rule, no matter what time of year it is. A neck beard instantly makes you look sloppy! Find a nice shave cream and clean it up just to the point where your neck creases when you tilt your head down. Don't shave it too high up either!! You don't want a chin strap beard. If you need further clarity on where to shave it to, ask your barber the next time you're in their chair. 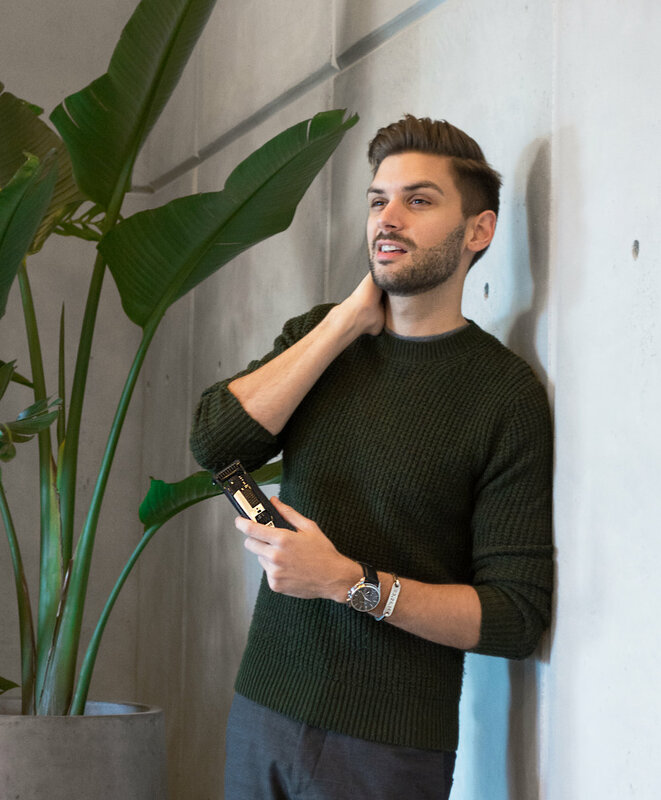 If you're feeling like a real stubble expert and don't want a clean line under your chin, use a Conair Man i-Stubble to fade your beard into your neck. Just click it to a closer and closer setting till it looks like your beard naturally grows that way. You can go a few days without having to clean up your neck with this technique because it appears more natural. Clean up stray hairs on your cheek. No man's beard grows cleanly at the top. There are a few random hairs that pop up all over your cheek. Trim them down so you have a cleaner appearance above and below your beard. In the Winter, I also change up my moisturizer routine. The cold air in the city is a LOT dryer, and the wind is incredibly harsh. In the morning now, I use a serum before using a lightweight moisturizer. It locks in a little extra moisture. At night, I use a thicker, heavy duty moisturizing cream so my skin will soak it up all night long. In the Summer, I'm a huge proponent of mud and charcoal masks, but I find they dry my skin out too much in the Winter. Instead, I opt for a cream based or even goopy looking mask. I put one on after I exfoliate my skin so I'm still cleaning out my pores. And of course a heavy duty eye cream all the time.... these eye bags might be genetic, but imma fight them till the bitter end! While it's great that you are growing your holiday facial hair out, no one likes longer hair in your ear or nose. Use Conair Man's Personal Grooming System to make quick work of it. It comes with several different heads, so you can get tight into your ears or general manscape the rest of your body (something you should also be doing). I trim my ear hair once a week, just to be sure there aren't any surprises when I'm surrounded by people at holiday parties. Speaking of parties and gifts, all of these Conair Man tools make PERFECT stocking stuffers, co-worker and friend gifts! I included one in my Holiday Gift Guide! Just think: men always need a great trimmer. I'm heading home for the holidays, so I have pared my grooming ritual down to products that will fit in my dopp kit! I usually leave my Personal Grooming System at home and opt for the Conair Man All-In-One Timmer or my i-Stubble. What do you guys do differently with your grooming routine during the Winter?? Let me know in the comments below! *This post is in partnership with Conair Man. All thoughts and opinions expressed here are my own, as always.